.....you will definitely be in for a surprise. But it will be no picnic. And not a teddy bear in sight. This was another game in our Age of the Wolf campaign. Our random strategy rolling had left us with the strange third round situation of fighting ourselves - Matt's Saxons and Normans were due to battle each other, as were my Danes and Vikings. We jigged things around a bit, with the Normans being ambushed by Vikings instead. Rolling on the scenario, it was a new battle to play, Ambush on the Forest Road. 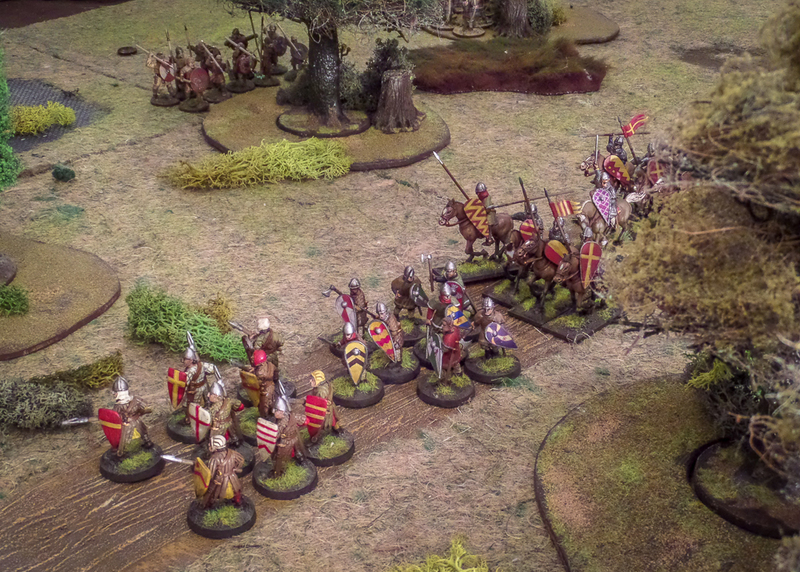 The Normans deployed first on a path running the length of the board, woods and other terrain either side of it. The vikings then deployed in or behind this terrain. Usual victory points for slaying the enemy applied, with additional victory points for the Normans for each unit they could get off the board. At first glance, I thought this was mission impossible for the vikings. There were far more exits from the board than I had units, so I could not hope to block them all. I did have one advantage in a large unit of 8 hearthguard, so I decided to use them very aggressively. Led by the warlord, they rushed to the vanguard and hurled themselves at the mercenary unit at the head of the Norman column. My thinking here was that they would wipe out this unit, spread fatigue to the unit behind them, and leave the Normans with one less Saga dice from the offset. In theory, a unit of 8 hearthguard will annihilate a unit of 8 warriors, but then the dice were rolled and only 7 warriors fell, at the cost of five hearthguard! In the Norman turn, these stragglers were then cut down, leaving the viking warlord a little lonely and exposed at the head of the Norman column. A backup unit of just 4 hearthguard rushed to reinforce the viking lord. The Normans had some real luck in that first turn and it continued as they rolled more and more Saga dice. Feeling confident, the Norman lord and his knights charged in to a unit of bondi, expecting to sweep them aside. Once again, the lowly warriors defied expectations and beat back an attack from an elite unit. In almost a carbon copy of the viking failure, the Norman knights were all felled, the Lord staggered back in shock. Such carnage on the forest paths, and all in turn 1. At the rear of the column, not much was happening. 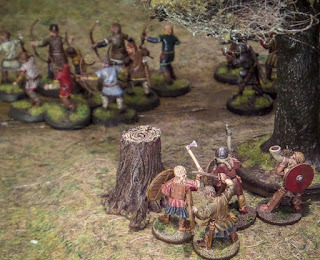 A couple of Norman crossbow troops fell to viking arrows, and vikings took position in the woods, but in the main we used all our Saga dice to fight at the head of the column. With all the death and destruction here, the Norman foot troops scarpered into the woods, leaving the Norman Lord and his knights facing the Viking lord and his hearthguard. Spurring his men forward, the Norman Lord faltered, his knights fought bravely but were beaten back. Exposed and alone, the Norman Lord was dragged from his horse by the enraged vikings, exacting revenge for the loss of their comrades. A very brief and bloody conflict, heavy losses of elite troops on both sides, with a narrow victory to the vikings. It was all over by turn three! As is so often the case with Saga, a real conundrum of a scenario. 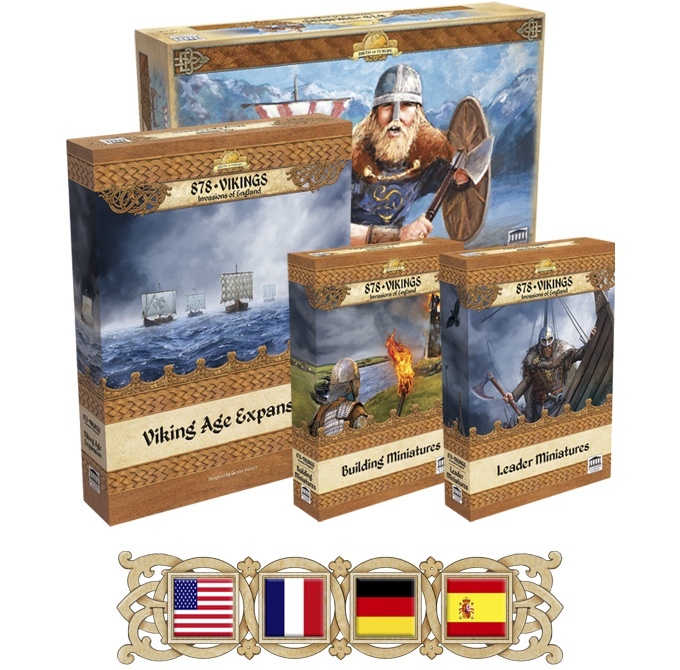 There was no way the vikings could block all the exits, and spreading themselves around the board meant each unit was alone and vulnerable to a concerted attack from the Normans. 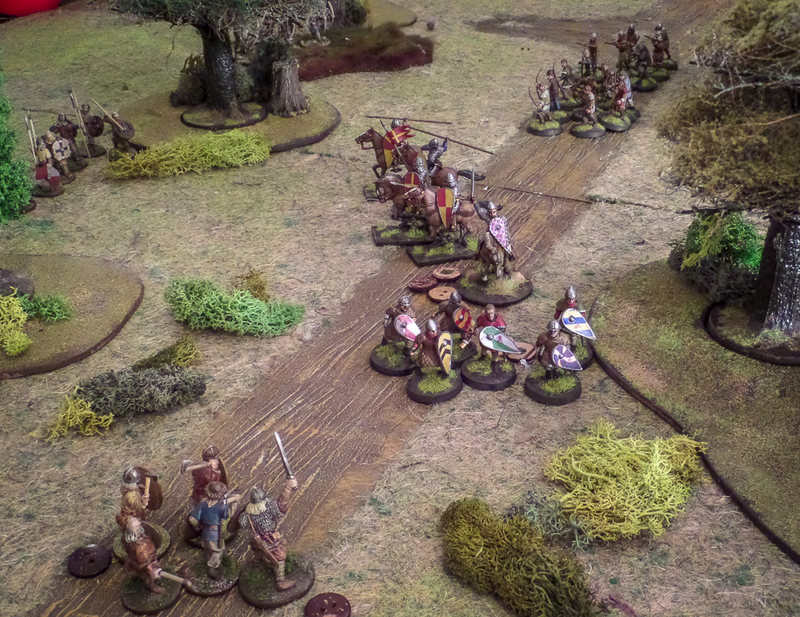 However, the Normans had to balance the urge to gallop from the field with the loss of Saga dice this would entail. An interesting scenario on both sides, one I would like to try again. I spotted this on the Saga facebook page. It's a board game based on the viking invasions of England in the ninth century. If you have been watching the vikings series on TV it seems very close to that story. Rather than me waffle on about the game, go take a look for yourself. As usual with kickstarter projects you have to do your own research. This company have already completed several kickstarters, so there should be minimal risk. I have backed several kickstarters and had very few problems. Most are a bit later than advertised, and one I was a little disappointed with the colour renditions, but on the whole I have been very happy with my buys. I have never dealt with this company but they seem to have a reputable track record. There's an early bird pledge saving $5 that lasts for a few more hours of today. It's not much to save but hey, every florin counts.